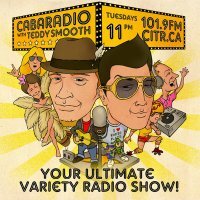 This Tuesday I was a guest on Cabaradio with Teddy Smooth on CITR 101.9 FM in Vancouver. We talked about my acting training, Say Wha?, my ‘music career’ and even shared our teen angst poetry. You can listen to the show HERE.